Bell Shakespeare present JULIUS CAESAR by William Shakespeare at the Playhouse, Sydney Opera House. I am going to fulminate. William Shakespeare's JULIUS CAESAR has been adapted for the Bell Shakespeare Company by playwright/actress Kate Mulvany with the Director, Peter Evans. Ms Mulvany makes a confession in her program notes that "Until this time last year, JULIUS CAESAR was not a play that I held close. Like many others, it was 'that play about war and men and togas and speeches' ". Well to be pedantic, there are only three others like it, in the Shakespeare canon, that fit the above criteria of war, men, togas and speeches: TITUS ANDRONICUS (1592), ANTONY AND CLEOPATRA (1606), and CORIOLANUS (1608). JULIUS CAESAR was written in 1599 following on from HENRY V (1598-9) and just before AS YOU LIKE IT (1599 - 1600), and the greatest of them all, HAMLET (1600-1601). Shakespeare, then, at the height of his powers (arguably). JULIUS CAESAR is a favourite English study in high schools, still. A legacy, perhaps, of a time when the classic languages of Greek and Latin were generally part of the curricula, and the principal source material of this play being Plutarch's PARALLEL LIVES would be a study tool in the Latin classes. That, besides the attractive macho charismatics of men at war and the Machiavellian intrigues of ambition and the dicing with the virtues of Honour and Loyalty that youth of a certain stage of development, physically, sexually and emotionally might find tantalising, makes JULIUS CAESAR a very male-friendly school text and subject indeed. What Ms Mulvany has sliced and diced, and adapted Shakespeare's play to, is a focused study of the psychological, internal struggles of the principals: Brutus (Colin Moody), Mark Antony (Daniel Frederiksen), Cassius (Kate Mulvany), Julius Caesar (Alex Menglet) and latterly (in this adaptation, briefly) Octavius (Rebecca Bower). Shakespeare in his great rhetorical verse flourishes, in monologue and scene exchanges, deftly manages his burgeoning craft skills for his pre-Freudian revelations. There is much to brood upon and seemingly, oppositionally, to flourish. Much for actors of quality to pounce upon with relish. The internal life - inner monologue at one boundary edge of the challenge (20th Century, Stanislavski Technique!!) to communicate, and on the further, other boundary, the use of language as the imaginative, in the moment tool, of revelation (16th Century traditions of verse rhetoric). Here is an attempt to underline the tragic insights into the humanity of these men in a thoroughly contemporary manner, alongside the histrionics of the era of the playwright's theatrical world of "words, words, words." What Ms Mulvany, and her accomplice in this adaptation, Mr Evans, is not interested in is the war scenes on the Plains of Philippi. They have been heavily edited and one of the delicious directorial problems removed. The final acts of the play have been excised, decimated really, and the school boys, probably thwarted in their vicarious pleasure expectations. Or, as in my case, the thrill of how this company will solve this famously towering directorial, story problem. Simple, for this Bell JULIUS CAESAR, don't do it. Shakespeare avoided, some may argue diminished, thereby. All these actors reveal the grasp of contemporary acting technique. Stanislavski rules. Their inner monologues richly invented, daringly indicated in pause and ellipse, intriguingly suggested with secondary activities, accompanied by great emotional and physical choices. The inner struggles, the inner monological turmoils, are paramount in their performances, and intellectually, they seem to be on top of the parallel journeys of story and emotional narrative. Much was seen to be felt. The problem for all of these actors (except Ms Bowers,perhaps), is that none have the vocal command to serve this great writer's unique and great achievement: the language. This basic requirement for this form of text responsibility is not present and we only see the feelings and thoughts, and because of the apparent vocal impairments of this company, we don't know why they have these feelings and thoughts, because the text is muffled, strangulated, ugly, unpleasant, and difficult to listen too. O YE GODS, YE GODS! MUST I ENDURE ALL THIS? Their instruments, generally lack range and flexibility. A crump horn at their service and not a trumpet. The 16th Century glory of Shakespeare, the great heritage of the English language in the present 21st century, is unable to be delivered in any particularity of harmony. These actors, generally, are able, or, have been encouraged to communicate Shakespeare's verse and prose in welters, blocks of generalised emotional noise, only. The sense of what they are saying is carried by the emotions, the internalised life, instead of the detailed use of sound, the sounds of the individual word that expands to particular phraseology, sentence structure and verse argument. The relish of the sounds and the vital imaginative 'click' of the words does not fuse in their identities and give these actors any 'mouth' sensation. Pleasure. Shakespeare's words are not digested by these actor's and served as gifts to us. The challenge is beyond them. Only half of the requirements that this kind of play presents were on offer. The unique, the rare, the unequalled reason why Shakespeare is a star in the canon of so called classic theatre, is not within most of these actors gambit. A GOOD VOICE. On page 96 of John Bell's new book, ON SHAKESPEARE, published this year, 2011, by Allen and Unwin, Mr Bell gives a list of what he looks for when auditioning actors for his company: "Someone whose voice is compelling and pleasant to listen to. It has range, colour, expression and flexibility…". The actors are in various contemporary suited clothes of grey and black (Set and Costume Designer: Anna Cordingley). On the set for this production, which looks like a contemporary foyer or meeting room of grey carpet, surrounded by 14 arm rest, black leather chairs, in the far right upstage corner stands a corroded, ruined Roman column, with parasitical flora growing on it and around it, shielded by silver scaffolding (which grows into a tower of protection, by the play's end) - a very trendy interior design. But progressively as the actors revealed the quality of their voices, I twigged that this column was a metaphor for the ruined vocal instruments of this company. An ironic illustration of the sound of the verse speaking quality of these contemporary actors!? The rough, guttural drone of Mr Menglet as a post stroke victim Caesar; the nasal coarseness of Ms Mulvany; the slightly strangled high tenor of Mr Moody and the complete lack of any vocal colour of any imaginative support from Mr Frederiksen's ruined instrument, was encapsulated in this genius stroke of design. Mr Evans must be held culpable for choosing these voices and/or guiding them to this limited means of expression. Cicely Berry, the Royal Shakespeare Company's Voice Director has written several books, on the voice for the actor, especially for the challenges of the actor of verse - Shakespeare. Her book, FROM WORD TO PLAY (2008), talks most refinedly about the actor's craft in what I would call sound sculpting. The innate need for man to communicate to each other began with sounds. These sounds were gradually shaped into words that expressed needs, emotions and gave those sounds concrete definitions, ultimately by surrounding the vowels with consonants. This was when man was, metaphorically 'a baby' inventing the languages to communicate. It is this sensitivity to the formula constructs of the sounds in each of our words that the actor must be alert to, fully fill out the communicative value of the words, the onomatopoetic qualities of the words. 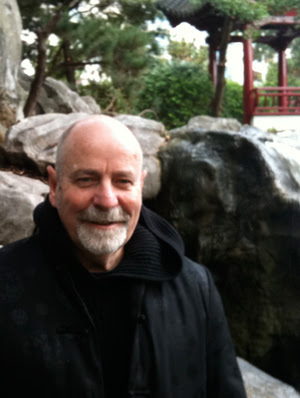 To acknowledge and do the baby steps in speaking and communicating to an audience, this playwright. The body language does follow these impulses. These actors did not demonstrate any such care or approach to skill. Since seeing this production, several weeks ago, on which I have had considerable struggle to respond too, and this is my second go at it, I attended a screening of DOCTOR ZHIVAGO on the big screen. Alec Guinness, in a small supporting, but key narrative role, used his voice in such a way that every word carried an intelligent emotional, detailed life of its own. One could 'see' and consequently 'feel' what he said as a visceral experience, that added up into sentence and speech information, intention and argument. Sounds, language communicating on many levels. It is, and was thrilling and relaxing, and invited me to participate with him. This sound is what I did not experience with this company - Australia's premiere Shakespearean Company. Some of you may argue that 1 - Guinness is English, and 2 - of a different theatre value generation, and 3 -that it is no longer necessary. It is a craft technique that is no longer useful. A technique of the past. But then, that same night I attended the Sydney Theatre Company's production of GROSS UND KLEIN and heard Cate Blanchett do the equivalent of the Guinness brilliance with language - it is not an antiquated concept of craft or contemporary playing choice, it is simply the difference between a fully prepared actor, dedicated to the great challenges of acting and preparing the instrument for flexible impulses of expression and not. With Shakespeare the better the instrument, the greater likelihood of success. I wanted to scream out Casca's lines to Brutus in the famous tent scene: "O YE GODS, YE GODS ! MUST I ENDURE THIS? "(Act III Sc IV) ten minutes into this production. Can you imagine my pain in the famous speeches over the body of Caesar as rendered by an intelligent but vocally handicapped Mark Antony. The mob would not have listened to this Antony and our history books would tell a different story. 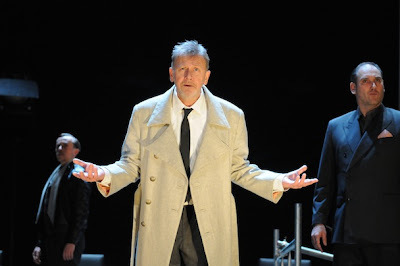 Like my response to Anthony Skuse's production of JULIUS CAESAR at the New Theatre this year, one can hardly respond to the detailed intentions of Mr Evans and his artistic team, as the key need of the production, the voices, were too great an obstacle to permit more than cursory engagement. I can recommend a visit to the film THE IDES OF MARCH .The Shakespearean themes well served without the need for the vocal dexterity of the real thing. Do go. BELL, John., 2011, "On Shakespeare", Unwin & Allen. BERRY, Cicely, 2008, "From Word to Play", Oberon Books. CRYSTAL, Ben., 2008, "Shakespeare on Toast" , Icon Book. Couldn't agree with you more. Unbelievable that the company purporting to be the vanguard of such technical understanding and quality should get it so wrong, and hire truly mediocre talents in this respect. I like Menglet even given his obvious technical deficiency, likewise Mulvaney, although she towered above the rest, for mine... but as for Moody and Friedrikson... Please! True, as well, that the voices of these actors are not of the Alec Guinness generation. The valuation of skills are very different indeed. More tragedy to them, I say, and to those of us who are prepared to accept less than is possible, and who do not care to point out their loss,. To witness so excusably, in such a short span, a devolution of skills, so swiftly, to such a catastrophic usage and sound. It really only requires 'training' and practice. A pure animal habit. It is simply preparing and maintaining an instrument. It does, however, require time and commitment. The development and maintenance of instrument craft ought to be part of the creative habit of the true artist. Every artist should aspire to it, Yes? It is not a generational or cultural impossibility. The Horses Mouth: "'Hell For Leather"